Click to read my brutal review. Anyone who has played the gems known as Psychonauts and Grim Fandango should know Tim Schafer’s name. 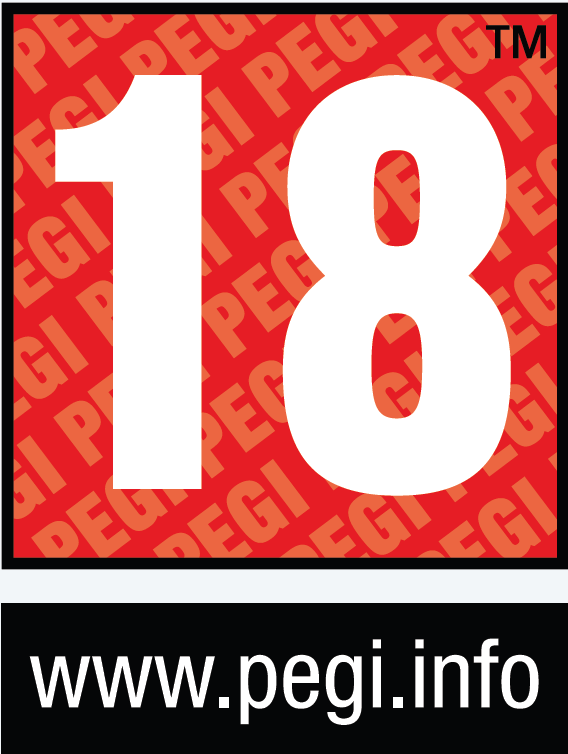 He is respected by many for making some of their favorite games. Brutal Legend is Schafer's latest endeavor, and with the hype and marketing, it looks like finally Tim Schafer and his company Double Fine Productions might have the commercial success that many think they deserve. While I truly hope they succeed, I find it somewhat saddening that Tim Shafer’s first big commercial success will be one of his least exceptional games. 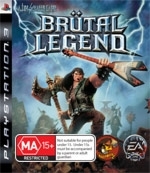 Brutal Legend’s story follows the tale of Eddie Riggs, the greatest Roadie of all time who is working for perhaps the lamest Metal Band of all time. After being seemingly killed by a falling set piece, he is transported to a mythical world of Metal. Here he finds an axe and learns that his guitar now has magical powers. He teams up with the enslaved human population of this world to take on the traitor General Lionwhyte and his demon master Doviculus to free the humans from oppression. Using his skills acquired as a roadie, Eddie Riggs helps organize the human remnants into an army to be reckoned with. While this story may seem like it has the makings of a great tale the characters never really get fleshed out. All of the characters seem to have very simple personalities and the story never really delves into their motivations. Everyone’s motivation seems to boil down to something as simple as “because I don’t like that guy” or “it was there”. The story does a much better job with its more humorous sections than the serious ones, but even the level of hilarity was not up to that of some of Tim Schafer’s previous works. You will chuckle and even laugh out loud a few times, but it is not as consistent as a game like Psychonauts. Since the entire point of the game is gathering an army to save humanity it should not come as any surprise that there will be some RTS action to be had, but that is not all you will be doing. You will always have direct control of Eddie Riggs, who controls like your standard brawler. One button attacks enemies with the axe while another calls down various magic with his guitar. There are a number of combos you can learn, but you will never be forced to use any of them. You can easily get through the entire game without using a single combo and instead you can just alternate between using magic with your guitar until you overheat it and slicing up enemies with your axe. Locking on to an enemy can be done by holding L2/LT, but why they did not allow you to just press the button to lock on instead of holding it is beyond me. Most of your free time in this mythical world of metal will be spent just traveling around, seeing the sites, and doing various sidequests and other activities that will please the Metal gods, thus earning you points for upgrading your equipment and skills. Sidequests are mostly comprised of around 4 activities repeated over and over again without any characterization to really back up the repetitive action. Some of the side quests however are more unique or have more interesting characters, so there are some bright spots. The campaign focuses a lot on the RTS gameplay in Brutal Legend. You set up a stage and then try to get fans, which are the sole resource. Fans are then used to purchase units. By pressing the right analog stick in you can fly around to survey the battlefield and decide where to send troops, but you never take the traditional birds-eye view of an RTS. LT/LB allows you to place a beacon of light that acts as a marker you can direct your troops towards. Ordering your troops is as easy as pressing a direction on the directional pad, but this only works for the troops that are in earshot. Picking a specific unit is a tedious process that you usually will not have the time to do, so most of the RTS gameplay involves sending large groups to certain points on the map, and then once you have amassed enough fans you build a large enough army to destroy your opponent’s stage. Since you directly control your commander at all times this allows for some unique additions to the RTS gameplay. The biggest addition is the ability to do team attacks by partnering up with another one of your units. Walking up to a unit and pressing Triangle/Y will team the two of you up, which can sometimes allow for some devastating attacks. Some examples of these are teaming up with the headbanging units to form a protective mosh pit around yourself, or teaming up with the ranged female units to let one of them shoot from your shoulder. Your commander unit can also use guitar solos to buff units or attack the enemies with a massive magic attack. Holding R2/RT brings up a solo menu and once you pick one you will be subject to an extremely simplistic timing mechanic while your commander shreds. Overall, the gameplay seems shallow. It is like that old adage about being a jack-of-all-trades but a master of none. Brutal Legend is filled with good ideas, but none of them are fleshed out enough. The RTS gameplay is stylishly thought out and fun at first, but the inability to pick a specific unit means most of the time you will not be thinking much about strategy. The brawling gameplay is a button masher with a lock-on system that is too cumbersome to use regularly, and the sidequests are repetitive. There is still fun to be had here, but it just is not as great as one might hope. 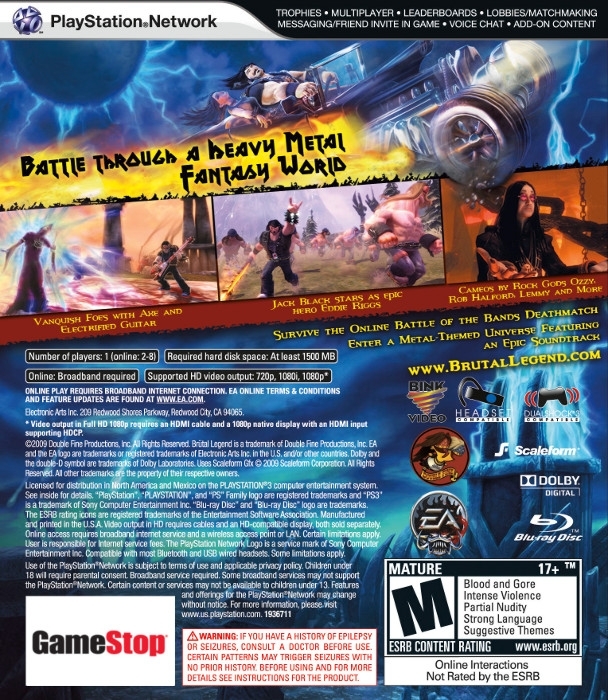 Brutal Legend has interesting visual presentation. It is full of style with lots of set pieces that would fit perfectly on a Metal album cover. The character models are also very unique and cartoonishly proportioned to fit well within this world of Metal. Unfortunately, the technical aspects of the presentation are not up to the same standards as the style. Pop-in is a constant issue while riding around in your car and often I would stop in an area and actually have to wait around for the people I was trying to meet there to appear out of thin air. 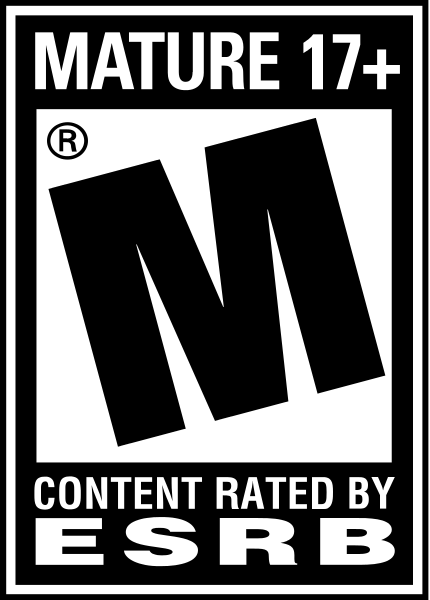 Framerate drops happen on occasion and the cutscenes are done with the in-game engine, which shows clearly on close inspection since clipping is a common occurrence. Stylistically I think the game is near perfect, but it definitely could have used some more time in development to iron out all the kinks. Sound design is fantastic mostly due to the selection and use of the licensed soundtracks. There are so many great Metal songs to listen to from Ozzy and Motorhead, to Tenacious D and Dethklok. Brutal Legend also uses these songs during some great moments that sync perfectly with the music. The voice acting is more of a mixed bag. I really appreciate that the developers got some famous Metal artists to bring their voices to the game and some do their role admirably such as Ozzy, but these are musicians and not actors which becomes blatantly obvious for a few of them. My first playthrough of Brutal Legend took me seven and a half hours. This included some screwing around and doing sidequests, so if you really wanted to you could probably complete the game in five to six hours. Online multiplayer is included in the form of the RTS gameplay. You can choose between the human Ironheade, the Drowning Death, or the Tainted Coil and then go to battle with up to seven other opponents/allies. Every game I played online had some serious lag issues, however, which can really mess up the timing based solo gameplay. There also isn’t a lot of variation in the multiplayer since there is only one game mode: last one standing wins. Once you finish the game you are free to travel around the world of Metal to see all the sites, but there is not enough unique stuff to do for this to last most people more than a few hours extra. Have you ever really wanted to love a game but ended up being disappointed? 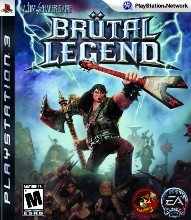 Brutal Legend is made by the developer of one of my favorite games from the last generation, utilizes music from some of my favorite bands, and the Metal inspired world makes for a fantastic style, but as a game it isn’t great. It may be oozing style with some amazing music and music inspired moments, but the gameplay ends up shallow on all fronts without enough depth to keep it interesting. The graphics have presentation issues, and the online multiplayer will not keep you amused for long. 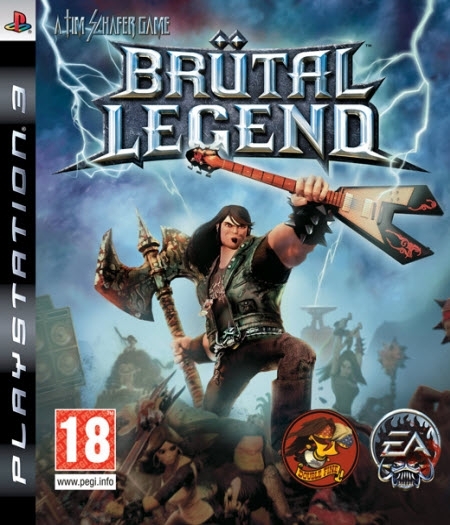 Brutal Legend seems like the kind of game that really could have been one for the ages, but sadly it did not live up to its potential. It is still fun, it just is not the amazing game I had hoped for.